In the Lanscape of Rolling Heels is a 20 minute long piece I created in collaboration with the performers Monica Brand, Cindy Chung, Tanya Mamedalin, Florencia Minniti, Jeff Prout, David Tirosh and Devika Wickremesinghe. Costumes by Mogollón, NYC (Monica Brand and Francisco Lopez) and Original Music/sound by Flavio Gaete with song by Margo Guryan “Good bye July”. In the landscape of Rolling Heels explores the banality that exists in the everyday, incorporating repetitive actions that can provoke an unknown evolution of images with implied narratives that carry strong and daring undercurrents. The piece presents a “landscape” of images that suggest a world where the spectator is challenged to choose those situations and details that can be identify with one self. In this way it is possible to recognize certain archetypes that could belong to our collective unconscious. In the Landscape of Rolling Heels has been presented in various stages of development, premiering in April 2005 at Channel Sur: Latino American Dance in New York, NYC organized and produced by Danspace Project and Luis Lara Malvacias. In June 2005 the piece was presented at NYU Tisch Schools of The Arts, NYC. 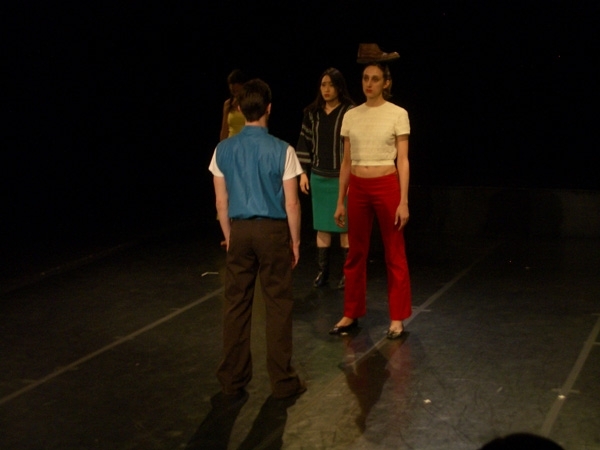 In November 2005 at Dixon Place as part of the Crossing Boundaries Series and in November 2006 at Danspace Project, saint Mark’s Church as part of the Draftwork Series.